Published: April 9, 2014 at 09:55 a.m. 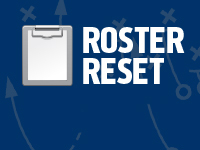 Updated: April 9, 2014 at 12:32 p.m.
We continue our Roster Reset series by picking the most improved position group in the AFC South. The offseason in the AFC South has been more about departures than arrivals. Matt Schaub is gone from the Texans, and the Titans no longer house Chris Johnson or Kenny Britt. The division is in flux with the presence of two new coaches in Houston and Tennessee, but it's Jacksonville's second-year duo of Gus Bradley and general manager David Caldwell who have our attention. The Jaguars aggressively raided the open market to upgrade their defensive end rotation with the signings of Chris Clemons and Red Bryant, two former Seattle Seahawks who give Bradley a pair of reliable defenders already familiar with Jacksonville's scheme. Bryant is an upgrade over Tyson Alualu, who now shifts into spot duty after starting all 64 games of his four-year career. That's good depth. Bryant remains a strong run defender while Clemons will split time with Andre Branch and Jason Babin on the edge as a "Leo" pass rusher. The concern for Clemons and Babin is age -- they're both on the wrong side of 30 and Bryant's not far behind -- but the Jaguars now have more flexibility and depth at the position than they have had in years. It's also a sign that veterans who know Bradley yearn to play for him, another positive development for this growing squad.